Doncaster RLFC will have Liam Harris back in their side to face struggling West Wales Raiders in tomorrow’s Betfred League One clash at Featherstone (1pm). 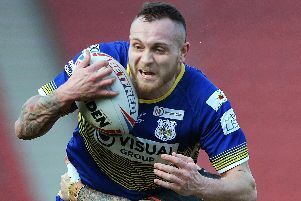 Harris, who was signed by Super League giants Hull FC as cover for the injured Mark Sneyd earlier in the season, returns to the South Yorkshire club this weekend as part of the dual registration arrangement having performed well in a number of top flight games. With the club having signed former Keighley scrum-half Matty Beharrell last week, Harris will play full-back in his first game in Doncaster colours since the defeat at Oldham at the start of last month. “He has played there before for us and hopefully he’ll give us the extra strike power in attack which we have probably lacked at times,” said assistant coach Pete Green. Young centre Cameron Scott, who played for Hull in the Super League last weekend, is available again but the Dons will be without back-rower Jansin Turget who was included in Hull’s squad for last night’s game against St Helens. Hull FC team-mate Brad Fash, who made the odd appearance for the Dons during Gary Thornton’s spell in charge, comes into the Doncaster squad. Although Green stressed that the Dons are primarily focused on West Wales this weekend he admitted that they were also looking at the bigger picture. “We will also have an eye on the visit to Hunslet next weekend and looking to build a platform for that game which means avoiding the temptation to go away from the game-plan and trying to force passes that aren’t really on,” he said. Although Green, who has been in a similar situation in the past, admits to feeling some sympathy for the West Wales players in what is proving a particularly difficult debut season for the club, he says the Dons need to capitalise on the chance to boost their points difference which could prove crucial in their play-off bid.